3 Jan 1548 Part of Viceroyalty of Peru. los Charcas created to administer Upper Peru. 25 May 1809 - 6 Aug 1825 Bolivian war of independence. Bourbon king of Spain deposed by Napoleon. of Peru (Provincias del Alto Perú). South Peru components see under Peru). 12 Feb 1861 Spain recognizes the independence of Bolivia. old style lingers until 1908). 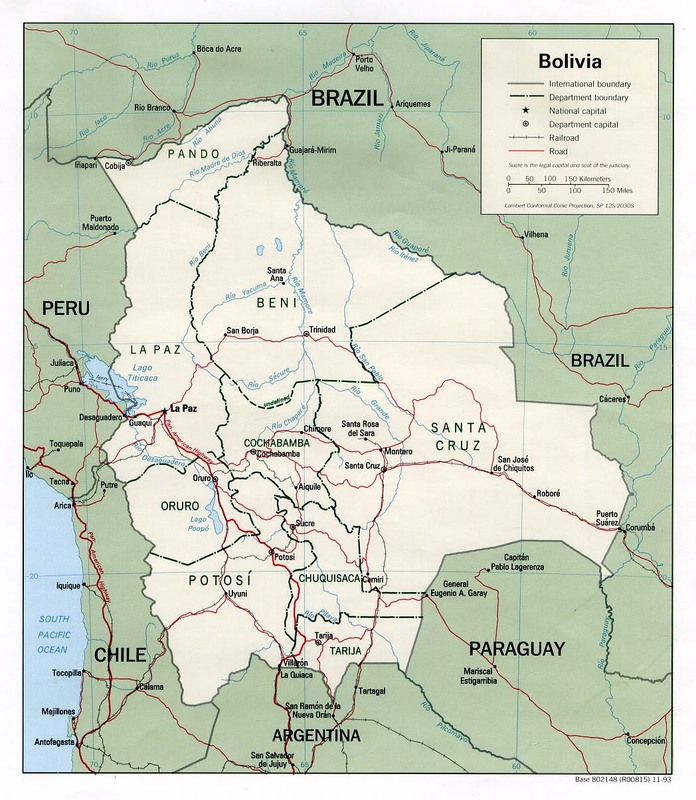 4 Jul 1899 - 25 Apr 1900 Acre independent of Bolivia (see under Brazil). Territorial Dispute: Chile and Peru rebuff Bolivia's reactivated claim to restore the Atacama corridor, ceded to Chile in 1884, but Chile offers instead unrestricted but not sovereign maritime access through Chile for Bolivian products; contraband smuggling, human trafficking, and illegal narcotic trafficking are problems in the porous areas of its border regions with all of its neighbors (Argentina, Brazil, Chile, Paraguay, and Peru). 28 Jan 1782 Intendencia of Cochabamba (part of Río de la Plata). 1810 End of Spanish rule. 11 Aug 1825 Part of Bolivia. 28 Jan 1782 - 1810 Intendencia of Córdoba (part of Río de la Plata). 28 Jan 1782 Intendencia of La Paz (part of Río de la Plata). 16 Jul 1809 - 1809 Under the Revolutionary Junta. Jan 1811 - Jul 1811 Argentine occupation. 28 Jan 1782 Intendencia of Potosí (part of Río de la Plata). 25 Nov 1811 - 20 Sep 1811 Argentine occupation. May 1813 - Dec 1813 Argentine occupation. May 1815 - Dec 1815 Argentine occupation.